Nashville, Tenn. (Oct. 3, 2018) – Two weeks before TobyMac's The Elements hits, the 7X GRAMMY® winner is unveiling the newest single “Scars,” a track that is admittedly close to the artist. Processing life as a believer, husband, father and artist fueled the cultivation of his upcoming album, available Oct. 12. Pre-order for The Elements is available now, with an instant gratis of “Scars." 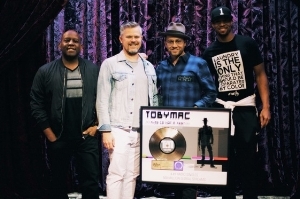 TobyMac was honored with the RIAA certification for his sixth solo gold record - the GRAMMY® winning THIS IS NOT A TEST - in his hometown of Nashville. The honor comes two weeks before the multi-platinum selling artist drops The Elements, his first new album in three years. 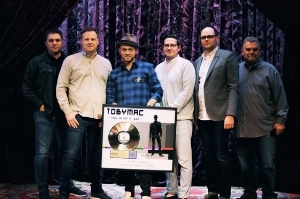 TobyMac with Capitol CMG's Steve Blair, Brad O’Donnell, Hudson Plachy, David Sylvester and Peter York. To pre-order, The Elements click here. For the latest touring information, including his upcoming “TobyMac & DiverseCity Band: The Theatre Tour” along with the 2019 arena-filled “HITS DEEP Tour,” visit www.TobyMac.com.